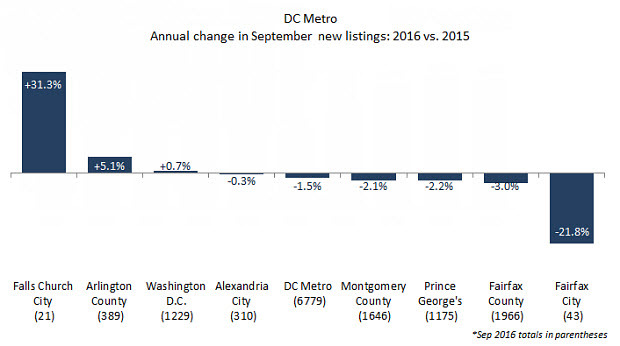 The DC metro housing market kicked off the fall season with some record high levels for closed sales and prices for the month of September. This good news offsets the decline in new and active listings, continuing the lack of robust inventory for buyers in the DC area. Closed sales for the month of September were up 1.6% from last year, breaking the 2015 decade-high peak. This month also saw a near repeat of the median sales price record high set in September 2015 with $399,999 compared to last year’s $400,000 (pretty much the same price!). The current market is very positive for those sellers who have listed their homes – eager buyers, excellent 97.5% sales price to original list price ratio, and average 24 days on the market. Buyers are more likely to face more competition and must be finance-ready to bid on the available homes. However, even though median prices are higher, the DC metro area remains a solid and stable housing market for those who want to become homeowners. Keep in mind that these numbers are for the entire DC metro area, so each particular neighborhood can have its own version of numbers for sales, inventory, and prices. We can go over those specific numbers to both sellers and buyers, and can apply them to how you should list your home or what to expect if you want to look in a particular neighborhood. September 2016’s median sales price of $399,900 was just slightly below last year’s $400,000 and down 5.0% or $20,850 from last month. 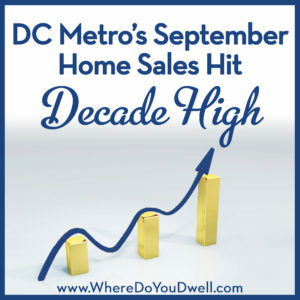 Sales volume across the DC Metro area was more than $2.0 billion, up 0.1% from last September. Closed sales of 4,183 were up 1.6% compared to last year, the highest September level in a decade. New contracts decreased by 1.9% to 4,692, the first year-over-year decline since January 2016. New listings of 6,779 were down 1.5% year-over-year but up 23.3% compared to last month. Active listings of 11,102 are down 14.3% compared to last year. This is the fifth consecutive month of declines in year-over-year inventory levels. Home Prices — Prices are above the 5 and 10-year September averages by 3.2% and 9.3%, respectively. September’s regional overall median sales price was $399,900, virtually the same as last year’s $400,000, but was down 5.0% or $20,850 compared to last month. Compared to last September, single-family detached home prices decreased 2.8% to $473,900, condos increased 1.5% to $299,450 and townhomes held steady at $399,900. Falls Church City remains the most expensive location in the region, with a median sales price of $595,000, which is 26.5% less than last year, but the small number of sales (17) makes the data overly sensitive to changes. Prince George’s County continues to be the most affordable area in the region, with a September median sales price of $260,000, up 8.3% from last September. 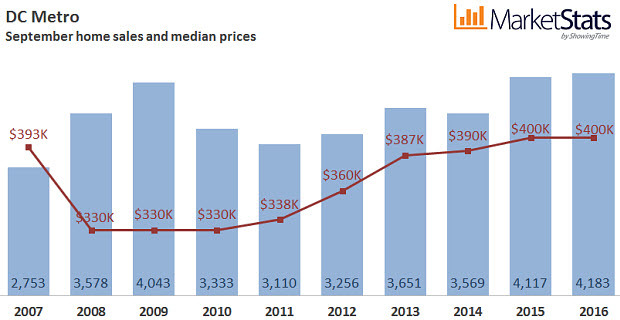 The regional YTD median sales price compared to last year is unchanged at $415,000. Prince George’s County (+8.3%) leads the region in YTD price growth. Fairfax City (-0.5%) and Arlington County (-1.5%) are the only jurisdictions to see declines in YTD prices versus 2015. Closed Sales — Townhome sales were up 10.9% and condo sales were up 4.4% while single-family detached sales were down 4.8%. September’s closed sales of 4,183 were up 1.6% from last year, the highest September level in a decade, but down 17.8% from last month. Sales were above the 5-year average of 3,755 and the 10-year September average of 3,559. Across the region, sales data was mixed. 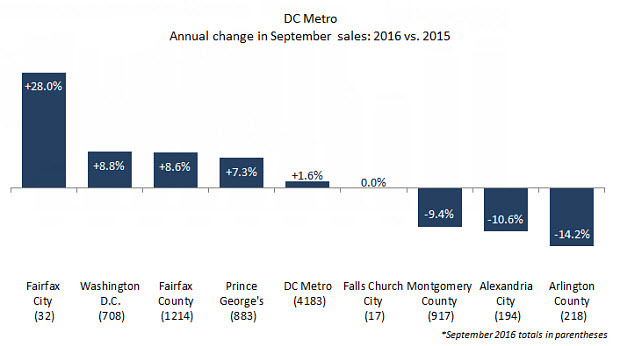 The largest percentage decline in sales was in Arlington County (-14.2%), and the largest percentage increase was in Fairfax City (+ 28%). New Pending Sales — Pending contracts were above both the 5-year average of 4,436 and the 10-year average of 3,932. There were 4,692 new pending sales at the end of September 2016, down 1.9% compared to last year and down 4.4% from last month. Only condos saw an increase in pending sales, up 3.3% to 1,271. Townhome pending sales were down 1.4% to 1,252 and single-family detached homes saw a 5.0% decrease to 2,167. For the entire region, new pending contracts for January-September are up 3.8% to 48,890. New Listing Activity — September new listings of 6,779 are 32.3% above the 10-year low of 5,124 seen in 2012 and 13.7% below the September 2007 high of 7,856. New listings in September increased 23% compared to last month but declined 1.5% compared to last year. While condos saw a 2.9% gain in the number of new listings to 1,881, the number of new single-family detached listings declined 1.3% to 3,266 and the number of new townhome listings declined 6.3% to 1,631. New listings are above the 5-year average of 6,284 and the 10-year average of 6,413. Inventory – Active inventories of 11,102 are slightly above the 5-year average of 11,015, but well below the 10-year average of 15,210. Active inventories are down 14.3% from last September but up 7.7% from last month. All property types show a decrease in inventory levels over last year, with townhome inventories down 19.7%, single-family detached down 13.8% and condos down 11.1%. September inventories exceed the 2013 low of 9,340 by 18.9%. All jurisdictions in the D.C. Metro area saw declines in inventory levels, except for Falls Church City. The largest decline of 19.5% was in Alexandria City. The regional average SP to OLP ratio for September was 97.5%, up from last year’s 97.1% and unchanged from last month. Over the last decade, the region’s September average sales price to original listing price ratio ranged from a low of 92.8% in 2008 to a high of 98.0% in 2013. On average, homes in Prince George’s County sold at 98.3% of their original listing price in September, the highest in the region, and up significantly from the 97.3% seen last year. Days on Market — Condos and single-family detached both had a median DOM of 27, while townhomes had a median DOM of 18. The median days-on-market in September was 24 days, down three days from last year, but up two days from last month. September’s median DOM matched the 5-year average of 24 days but was well below the 10-year average of 36 days. The highest median DOM in September was recorded in Falls Church City at 33 days (down from 36 last year). The lowest median DOM is in Washington D.C. at 16 days (up from 14 days last year). Across the region for the period January-September, median DOM of 20 days is the same as it was for the same period last year. 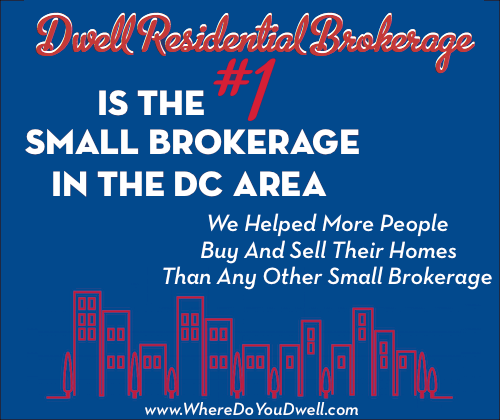 Contact us if you want more detail information on a specific neighborhood(s) in the metro DC area. Remember that the District, Arlington, Alexandria, Montgomery County, Prince George’s County all have different neighborhoods (and even streets!) that can have their own version of numbers that vary from the general DC metro numbers analyzed here today.